Gregory Boyle: Save the world or savor it? Ministry focused on saving the world leads to burnout and depletion, says the founder of Homeboy Industries. Our choice is always the same: save the world or savor it. Countless thousands of former Los Angeles gang members have had their lives transformed -- in some instances, literally saved -- thanks to Homeboy Industries, the world’s largest gang rehab and re-entry program. Yet ministry is not about saving the world or saving people, says the organization’s founder and executive director, Father Gregory Boyle. Ministry aimed at saving people and the world instead leads to burnout, he said. For Boyle, ministry is never about depletion. “It used to be, when I used to think my job was saving lives,” he said. “But now I think saving lives is for the Coast Guard. Boyle was at Duke University recently as a practitioner-in-residence at the Kenan Institute for Ethics. While at Duke, he spoke with Faith & Leadership in an interview conducted by L. Gregory Jones, the senior strategist at Leadership Education at Duke Divinity and a professor of theology at Duke Divinity School. Fr. 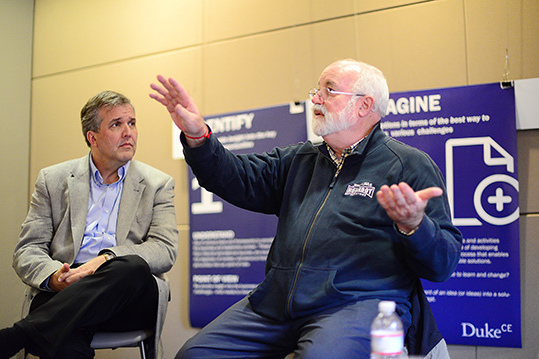 Gregory Boyle (right) talks with L. Gregory Jones and the Leadership Education staff about Homeboy Industries. He also met with the staff of Leadership Education at Duke Divinity in a conversation moderated by Jones. The following are excerpts from Boyle’s visit with the Leadership Education staff. A lot of times, people ask, “How did you ever think this up?” And the truth is, nobody would have thunk this up. I certainly didn’t. But you evolve, and you walk backwards into things, and the next thing you know, “Oh my God, here we are. How did that happen? How did we get to a place like this?” It’s like what E.L. Doctorow said about writing a novel. You’re on a country road, there are no lights, it’s a moonless night, and you can only go as far as your headlights take you. And then you get there, and then you can only go as far as your headlights will take you again. And that’s kind of like the story of Homeboy. 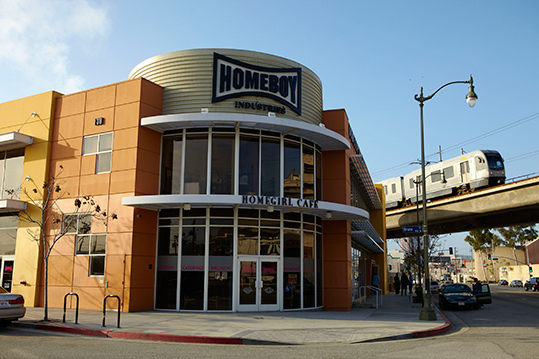 Homeboy Industries is located in the heart of downtown Los Angeles. I talk a lot about kinship, and I say, “No kinship, no peace; no kinship, no justice; no kinship, no equality.” We’ve become focused on peace, justice and equality, when the truth is, none of those things can happen unless there’s some undergirding sense that we belong to each other, that we’re connected, that we matter. But the good news is, if we focus on kinship, the byproduct of that effort is peace, justice and equality. It’s how it happens. Our mistake is that we focus on peace, justice and equality, and we herniate ourselves trying to get peace, justice and equality, and then we’re surprised that we burn out and that we never really get close to it. The thing I deal with all the time is this idea of the good guy and the bad guy. Desmond Tutu says there are no monsters. There are monstrous acts, but there are no monsters. And to that you might go, “Well, yes, there are,” or you might say, “Well, duh,” but either way, the truth is, we operate like there are monsters. We operate as if there are people out there who don’t belong to us. Ask Jesus to identify somebody who doesn’t belong to us, you’re going to get a big fat zero. Jesus will not be able to come up with a name. Ministry’s not meant to be like a gas tank, where you begin the day with a full tank and by the end of the day your tank is on E. Something’s wrong if that’s the way it works. If the intent is to save people, or even to help people, then it works that way. You’re going to be depleted. But if the task is allowing yourself to be reached by people, can you receive people? Can you be anchored in the here and now and practice the sacrament of the present moment? If you can do that, then it’s all delight and it’s all amazement and it’s all awe. We’re only saved in the present moment. If we’re not saved in the present moment, we’re not saved at all. For me, it’s never about depletion. It used to be, when I used to think my job was saving lives. But now I think saving lives is for the Coast Guard. Our choice always is the same: save the world or savor it. And I vote for savoring it. And, just because everything is about something else, if you savor the world, somehow -- go figure -- it’s getting saved. The need to belong is a presumption that we all make about kids joining gangs. Recently, I had a reporter say, “We all know that kids join gangs because they want to belong,” and I said, “Well, no. Actually, no.” And he says, “Everyone knows that.” Like we’re in a Geico commercial. And I said, “I joined the Little League team because I wanted to belong. But a kid joins a gang because he wants to die.” And that’s kind of a key. We get so stumped by “I’m going to save the world” or “I’m going to build an orphanage.” All those things are good; I don’t mean to disparage activity. But we get tripped up, and this is why people burn out and there’s compassion fatigue or whatever the hell you want to call it. But I learned a long time ago that no amount of me wanting that guy to have a life is the same as that guy wanting to have a life. So in the meantime, what do you do? You wait and you love and you cherish and you know that all mature spirituality is about tenderness. That’s the mark of mature spirituality, because tenderness is the connective tissue. It’s the only thing that joins us together.